SAN FRANCISCO-The Aug. 2-4 Tenth National Convention of Socialist Action attracted revolutionary fighters, antiwar activists, trade unionists, and youth from across the country. After four months of pre-convention discussion, Socialist Action members debated and approved three major resolutions that set the political and organizational framework for the party’s activities in the coming year. In the course of the three-day convention delegates joined in spirited discussion covering every major arena of party work while at the same time focusing on winning the next layer of revolutionary youth to Socialist Action. Gerry Foley, International Editor of Socialist Action newspaper, presented the International and World Movement Report, in which he reviewed the party’s relations with the Fourth International (FI), the world socialist movement with which Socialist Action maintains fraternal relations. Foley reported that the French FI section, the Revolutionary Communist League (LCR), recruited almost 1000 members in the course of its participation in the recent national elections. The LCR’s youthful presidential candidate, Olivier Besancenot, won 4.3 percent of the vote (1.3 million votes). While critical of the LCR’s decision to call for a “vote against Le Pen” (meaning a vote in favor of the rightist capitalist candidate Jacques Chirac) Foley concluded that this decision, though flawed in principle, did not in fact signify a turn toward rejecting working class independence. The LCR’s election program and its capacity to mobilize people in the streets against the fascist policies of Le Pen represented an important gain despite its error. The convention approved a special SA national conference to prepare for Socialist Action’s participation in the FI World Congress, set for 2003. Foley’s report also focused on revolutionary developments in Latin America, where the working-class character of the mass mobilizations and the pent-up hatred of the capitalist order have opened up new possibilities for building the revolutionary party. Greetings to the convention and a detailed report on the political situation in France were presented by LCR Central Committee member Xavier Moreau. International greetings were also received from the United Socialist League of Mexico, Socialist Action Canada, and from the Socialist Workers Movement (MST) of Argentina. The convention heard a special report on the national and international struggle to win the freedom of one of the world’s most well-known innocent political prisoners, Mumia Abu-Jamal. Presented by Jeff Mackler, who is a national coordinator of Mumia’s defense and who had recently returned from a six-hour visit with Mumia in Waynesburg prison, the report stressed that Mumia’s freedom rested in the further development of a broad and powerful mass movement capable of making the price for Mumia’s legal lynching too costly for the government to pay. Special guest Pam Africa, leader of the International Concerned Family and Friends of Mumia Abu-Jamal, updated convention participants on the most recent legal developments in Mumia’s case. 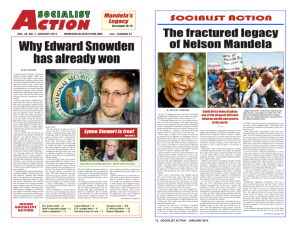 Africa called particular attention to the unique role of Socialist Action newspaper in presenting the most comprehensive and accurate coverage of the case. Michael Schreiber, Socialist Action’s Editor, presented the Organizational Report. He reported that recent fund-raising projects, including contributions from new friends and supporters, have enabled SA to maintain operations without any serious cutbacks. A $7000 three-month party-building fund drive goal was adopted as well as a campaign to win many new subscribers to Socialist Action newspaper. SA youth organizer Adam Ritscher reported that in the Duluth/Ashland area 19 young people had joined Youth for Socialist Action, the new youth group in political solidarity with Socialist Action. Following the convention five people joined Socialist Action. September 1, 2002 in Actions & Protest, Marxist Theory & History.